Colo Mountain is a solitary volcano in the Gulf of Tomini and is away from the subduction zone. The nearest volcano is the mountains in the mainland of North Sulawesi which is the product of subduction. Colo volcano is not a volcano formed by plate subduction process. It is said thus due to several things as follows. In the Tomini Bay region there are quite a number of epicenter earthquakes. Generally, earthquakes in the subduction zone have a hypocentrum in the Benioff zone. The Benioff zone around Colo Mountain is at a depth of over 200 km (relatively deeper). Colo Mountain could have been formed by subduction with the deep Benioff Zone, but if it were subduction, it should not be just one volcano formed in this area, but one row. In addition, Mount Colo is far from the subduction zone. In contrast to the volcanoes in North Sulawesi, the distance between the subduction zones and Mount Colo is fivefold, even more. Colo Mountain is thought to have been formed by rifting by subduction rollback. This rifting occurs in the Tomini Bay area which is an implication of the rollback subduction. Rollback subduction is a stretching of the crust due to a change in the angle of the subducting slab. This subduction occurs in the Sulawesi Sea, the subduction strike is parallel to the coastline of North Sulawesi. This area is North Sulawesi Trench (North Sulawesi Trench). With the stretch of the crust in Tomini Bay, meaning the crust under the Tomini Bay is getting thinning. This stretch itself occurs in Pliocene to Pleistocene. Formerly, the Gorontalo basin in Tomini Bay is not as deep as it is now. The basin began to deepen on the Miocene to the Pliocene (7-5 ​​million years ago) as the bending of the plate dipped southward in the Sulawesi Sea. Colo, in the Bugis tribal language means korekapi. As is known, that the people of Una-Una Island, where Colo Mountain is located, inhabited by most of the people who come from the Bugis and Gorontalo. Kampung Una-Una is the capital of Kecamatan Pulau Una-Una, an island that is known to be very fertile and is the main copra producer for Central Sulawesi region. So fertile so given the nickname as Island Ringgit. In addition to coconuts, Una-Una also produces cloves and seafood, especially fish, crabs, and sea cucumbers. The population before the 1983 Eruption was 7,000. The situation turned into a arid area after the eruption of Mount Colo eruption which took place in July 1983. Almost the entire village was badly damaged, even lost flat with the land hit by awanpanas and lava. Since then the township was moved to Wakai, a Togian Island group. In prehistoric, volcanic activity has occurred, followed by the formation of a 2000 m diameter caldera and form a lake. In 1898 or early 1900 there was a normal eruption and left the sumbatlava which became known as Gunung Colo. In 1975 a new solfatara / fumarola found on a hill on the northeastern slope, 1,500 m from the peak. The hill is outside the Crater Colo system and is known as Bukit Ambo. On August 20, 1982 Una Island shook earthquake earthquake, until the end of August as much 41 times the earthquake that the population felt. Meteorology and Geophysics Agency of Winangun, Manado said that the strongest earthquake occurred on August 24, at 00.46.43 WITA, a magnitude of 4.6 SR at a depth of 30 km. The tectonic earthquake again shook Una-Una Island in early July 1983 which was in power III on MMI slaka. The earthquake is increasingly increasing in number and intensity. After an 83-year break, on July 23, 1983 there was a terrible eruption that destroyed the lava plug and burned 2/3 of Una-Una Island. On July 18 the number of earthquakes increased and caused the first phreatic eruption. 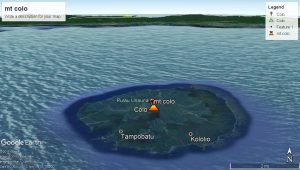 Until July 22, 1983 visual observation directly from Una-Una Island, after the eruption of visual observations made from Observation Post (temporary) in Wakai, Togian Island, lk. 40 km from Una-Una Island. A year later an integrated investigation was conducted, namely seismic investigation and eruption mapping. From seismicity it is known that between February and March 1984 there are still sporadic smoke eruptions from within the crater. In the integrated investigation is also known, that the lava plug was exhausted and left 3 (three) craters with different sizes. Una-Una Island is almost rounded with a center line of 20 km. The highest peak is Bukit Sakora (486.9 m) located in the northwest. Preliminary activity in prehistoric times, formed caldera with 2000 m diameter with crater lake. In the activities of 1898 or early 1900 formed a lava plug known as Colo Mountain adjacent to a crater lake known as the Pokai Lake. Before the 1983 Eruption, the existence of Pokai Lake, became a place of freshwater fish maintenance. Pokai Lake measuring 600 m long, 190 m wide 1.5 m deep, is at 250 m above sea level. As long as it is known, the temperature never exceeds the temperature. From the morphological form, the crater is open to the northeast, located almost in the middle of the island, with the north-south circle along the 1,350 m and the east – west along the 1750 m. The July 1983 eruption changed all that and produced 3 craters, each Crater Main, Crater II, and Crater III. Crater Main (former sumbatlava) diameter 1100 – 1350 m. In May 1984 flooded water area of ​​67 ha, but in February 1996 shrank to 30 ha. Crater II is located on the northeast of Bukit Sakora (highest peak of Una-Una Island), rounded in diameter 200 m. Crater III takes place in the southwest of Bukit Sakora. The shape is not perfect because of strong erosion. The lowest wall in the southeast opens towards the Main Crater.